Hello my crafty friend, thanks for flying by today! I’ve got a fun shaped card for you featuring the Mother’s Love digi-stamp from Heartcraft Paper. I just love the way it turned out. If you’re new to the world of digi-stamps, they are digital images that you download and print out. You can resize or print mirror images to suit your needs. They store on your computer, so they save space in your craft room too! They are also usually much less expensive to purchase, since the designer doesn’t have any manufacturing costs to pass on. I use digi-stamps almost as often as I use traditional stamps. For today’s card, I printed my image onto cardstock and colored it with Copic Markers. I used my ScanNCut to cut it out, leaving a narrow white border. I created the feather shaped card by die cutting a pair of blue cardstock feathers. The Lindsay Serata die set I used has an outline die, as well as a detail die. I cut the detail layer out of blue speckled pattern paper and glued it onto the top feather. Before gluing the back feather to the top, I scored it an inch from the edge, to form a hinge. I also stamped my sentiment at this point. When I glued the two pieces together at the hinge, I offset them slightly to make the card base look like two feathers overlapping. I liked the way this looked more than gluing them straight down on top of each other. To finish my card, I popped my image up with foam tape and adhered it to the top of the feather, sandwiching in a few loops of gold cord. I added a few details to the feather and bird/nest with gold, copper and white gel pens. Then I gave the bird a little sparkle with an Aqua Shimmer pen. I glued a few sequins in place and added Diamond Glaze on top of the sequins and over the eggs to add a little more shine to the card. And just like that, I have a beautiful Mother’s Day card ready to send out. It fits into an envelope I had on hand, but you can always create your own with your envelope punch board if you don’t have one. 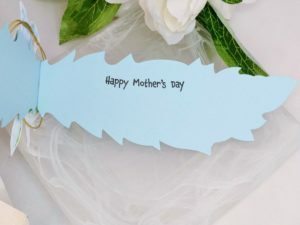 Are you making Mother’s Day cards this year? Quick note about the feather die set I used: this set is a Movers & Shapers set, with the outline designed to cut leather and other materials. It requires a special shuttle plate for the cutting sandwich. 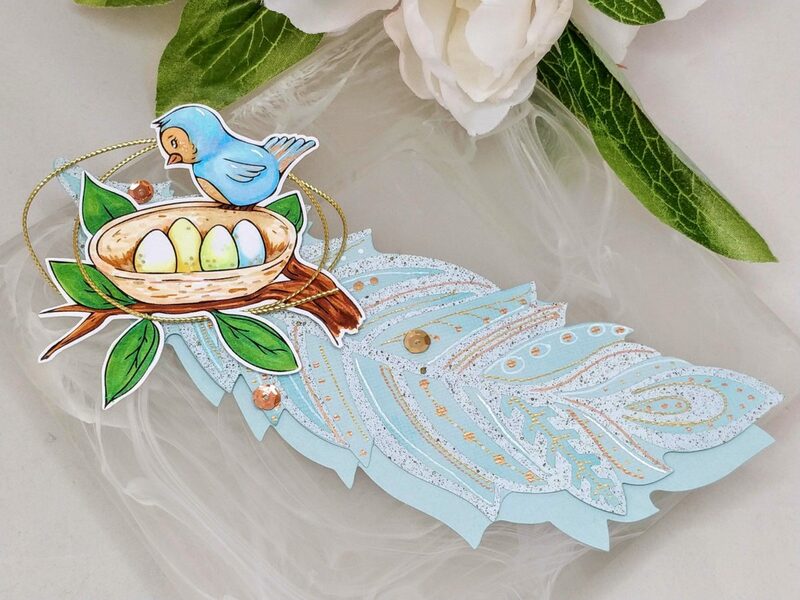 There are other feather dies and even free cut files that you can use to recreate this card, I already had these on hand though. This site uses affiliate links whenever possible, but only for products that I actually use and love. Thanks Sharon! I’m a big fan of shaped cards; they can turn an ordinary card into a card that packs a lot of wow! That came out beautiful love the colors !